As part of the build-up to this weekend’s round of the FIA World Endurance Championship (WEC) at Silverstone (24 – 26 August), nine drivers, accompanied by three of the series’ highly-distinctive racing cars – including two sports prototypes – headed for one of the Capital’s most iconic landmarks, the London Eye, to mark the UK debut of the championship. The official photocall saw the current championship points leader Allan McNish (Audi Sport Team Joest), father and son duo Martin Brundle and Alex Brundle (Greaves Motorsport), Anthony Davidson (Toyota Racing) and Karun Chandhok (JRM) of F1 fame, Darren Turner (Aston Martin Racing) and the all-British Strakka Racing team line-up of Nick Leventis, Danny Watts and Jonny Kane, gathered at the instantly recognisable attraction. The drivers and cars attracted plenty of attention as London’s tourists were treated to a taste of WEC. In addition to the drivers, two stunning sports prototype cars – the WEC Honda HPD ARX 03a (Strakka Racing) and Nissan Zytek Z11SN (Greaves Motorsport) – and the production-based, yet highly modified, Aston Martin Vantage V8 (Aston Martin Racing) were all lined up on the London Eye gangway. 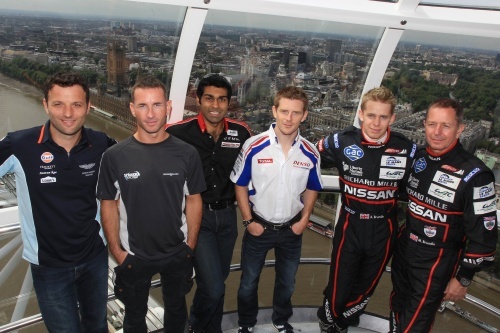 While experiencing an unmatched bird’s-eye view of London’s world-famous skyline and a clear view of the Olympic Park from the 360-degree panoramic glass capsules of the London Eye, the drivers shared their thoughts ahead of the upcoming race. Allan McNish: “It’s always exciting to be back racing in the UK and at Silverstone, especially this year with us leading the WEC right now. We’re aiming to build on that this weekend, but the competition is going to be tight – not just internally within Audi, but also with Toyota. I’m sure after Le Mans they’ll be buoyant and keen to have a good race. Martin Brundle: “I’m really looking forward to this weekend. The last time I raced sports cars at Silverstone was 21 years ago, but it was a good race, so hopefully we can repeat that. I’ve been around the new circuit, but I’ve never raced on it, so that will be another new for me. I really enjoyed racing with my son, Alex, at Le Mans, so to get a chance to race with him again at Silverstone is fantastic. Tim Baillie and Etienne Stott, Gold medalists for Team GB in Canoe Slalom C2, will be waving the green flag for the start of the race at Silverstone. The flag will be waved at 11:56, at the start of the formation lap.